1 APTAMERS: LIGANDS FOR ALL REASONS (Jean-Jacques Toulme , Jean-Pierre Daguer, and Eric Dausse). 1.2 The Power of Selection and Aptamer Refinement. 1.3 The Chemistry Drives the Shape. 2 SELEX AND ITS RECENT OPTIMIZATIONS (Beate Strehlitz and Regina Stoltenburg). 2.2 Aptamers and Their Selection by SELEX. 2.3 Modifications of SELEX Technology. 2.4 Advantages and Limitations of Aptamers and Their Selection Technology. 2.5 Applications of Aptamers Being Developed for the Market. 3 ELECTROCHEMICAL APTASENSORS (Itamar Willner and Maya Zayats). 3.2 Electrochemical Aptasensor Based on Redox-Active Aptamer Monolayers Linked to Electrodes. 3.3 Enzyme-Based Amplified Electrochemical Aptasensors. 3.4 Amplified Electrochemical Aptasensors Based on Nanoparticles. 4 APTAMERS: HYBRIDS BETWEEN NATURE AND TECHNOLOGY (Moritz K. Beissenhirtz, Eik Leupold, Walter Stocklein, Ulla Wollenberger, Oliver Panke, Fred Lisdat, and Frieder W. Scheller). 4.2 Specific Features of Aptamers. 4.3 Electrochemical Detection of Nucleic Acids. 4.4 Cytochrome c Binding by Aptamers. 4.5 DNA Machines and Aptamers. 5 DETECTION OF PROTEIN–APTAMER INTERACTIONS BY MEANS OF ELECTROCHEMICAL INDICATORS AND TRANSVERSE SHEAR MODE METHOD (Tibor Hianik). 5.2 Immobilization of Aptamers on a Solid Support. 5.3 Detection of Aptamer–Ligand Interactions. 6 BIOSENSORS USING THE APTAMERIC ENZYME SUBUNIT: THE USE OF APTAMERS IN THE ALLOSTERIC CONTROL OF ENZYMES (Kazunori Ikebukuro, Wataru Yoshida, and Koji Sode). 6.1 Aptamers as Molecular Recognition Elements of Biosensors. 6.1.1 Comparing Aptamers to Antibodies. 6.2.1 Biosensor Systems That Do Not Require Bound–Free Separation. 6.3 Evolution-mimicking Algorithm for the Improvement of Aptamers. 7 NANOMATERIAL-BASED LABEL-FREE APTASENSORS (Kagan Kerman and Eiichi Tamiya). 7.4 Label-Free Aptasensors Based on Localized Surface Plasmon Resonance. 7.5 Forthcoming Challenges and Concluding Remarks. 8 APTAMER-BASED BIOANALYTICAL ASSAYS: AMPLIFICATION STRATEGIES (Sara Tombelli, Maria Minunni, and Marco Mascini). 8.2 Bioanalytical Assays Based on Aptamer-Functionalized Nanoparticles. 8.3 Aptamers and Quantum Dot–Based Assays. 8.4 Aptazymes and Aptamer-Based Machines. 8.5 Polymerase Chain Reaction as an Amplification Method in Aptamer-Based Assays. 9 KINETIC CAPILLARY ELECTROPHORESIS FOR SELECTION, CHARACTERIZATION, AND ANALYTICAL UTILIZATION OF APTAMERS (Sergey N. Krylov). 9.1.2 The Concept of NECEEM and ECEEM. 9.2 Selection of Aptamers Using KCE Methods for Partitioning and Affinity Control. 9.2.1 NECEEM-Based Selection of Aptamers. 9.2.2 ECEEM-Based Selection of Aptamers. 9.2.4 Future of KCE Methods for Aptamer Selection. 9.3 Measurements of Binding Parameters of Target–Aptamer Interaction by KCE Methods. 9.3.2 Temperature Control Inside the Capillary. 9.4 Quantitative Affinity Analysis of a Target Using Aptamer as an Affinity Probe. 10 APTAMERS FOR SEPARATION OF ENANTIOMERS (Corinne Ravelet and Eric Peyrin). 10.2 Generation and Properties of Enantioselective Aptamers. 10.3 Immobilized Aptamers for Enantiomeric Separation by Liquid Chromatography. 10.3.1 Stationary-Phase Preparation and Column Packing. 10.3.3 RNA Aptamer-Based CSPs and the Mirror-Image Strategy. 10.4 Aptamers for Analysis of Enantiomers by Capillary Electrophoresis. 10.4.1 Aptamers as Chiral Additives in the Background Electrolyte for CE Enantiomeric Separation. 10.4.2 Aptamers for the Design of an Affinity CE-Based Enantioselective Competitive Assay. 11 APTAMER-MODIFIED SURFACES FOR AFFINITY CAPTURE AND DETECTION OF PROTEINS IN CAPILLARY ELECTROPHORESIS AND MALDI–MASS SPECTROMETRY (Linda B. McGown). 11.2 Aptamer-Modified Capillaries in Affinity Capillary Electrophoresis. 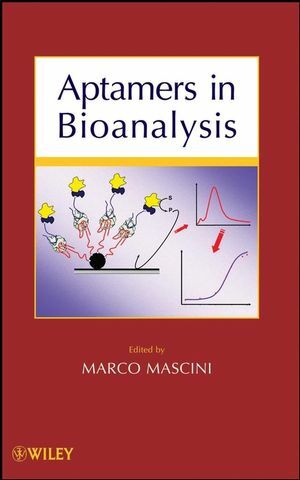 11.3 Aptamer-Modified Surfaces for Affinity MALDI-MS.
11.3.2 Affinity MALDI-MS of Thrombin. 11.3.3 Affinity MALDI-MS of IgE. 11.4 Beyond Aptamers: Genome-Inspired DNA Binding Ligands. 12 STRATEGY FOR USE OF SMART ROUTES TO PREPARE LABEL-FREE APTASENSORS FOR BIOASSAY USING DIFFERENT TECHNIQUES (Bingling Li, Hui Wei, and Shaojun Dong). 12.2.4 Electrochemical Aptasensors with Nonlabeled Redox Probes. 12.6 Liquid Chromatography, Electrochromatography, and Capillary Electrophoresis Applications.